The Line Width option is available on the View menu. To show lines with a particular width, check the Show Line Width box. You can move the slider to select how wide you want the lines to appear. The width is measured relative to the pixel size of the raster image. A line of width 1 is drawn as wide as one pixel. A line of width 2 is drawn twice as wide as one pixel, and so on. If the Show Line Width box is not checked then the lines will be drawn as thin as possible, so that they don't display any thicker as the zoom scale is increased. 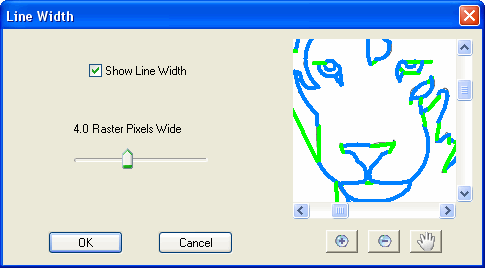 This setting also affects the line width used in some of the vector output files.